Floribunda (malus 'floribunda') is a good choice for a small sunny garden. With its dense spreading habit and long-lasting fruit, it provides a welcome food source for wildlife in winter. 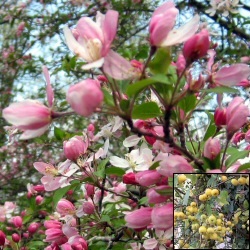 Charming, pale pink flowers are produced in spring, followed later by small, yellow to golden coloured fruit which quite often last well into winter, if birds do not get them first. Expect a final height of 8m so ideal for a small to medium sized garden. Message card included at no additional cost if required. Floribunda is supplied at of height of between 1.5m and 2.2m in a 7-12L container, which means that the tree can be planted any time of the year and with better results than either bare-root or rootballed trees. They are 2-3 years old and the height range given is broad to take into account when in the year you buy them and what the previous weather has been like. Generally speaking, just after August on average you should get around 1.8m. If you buy just before August (risky as stock is low leading up to this point) then you will likely get much taller. As with all issues with Mother Nature, we have no control over her and this is just a general guideline. You can request the tallest specimen we have at checkout.